Victoria and Brian were full planning clients of mine - we started working together back in January for a September wedding. 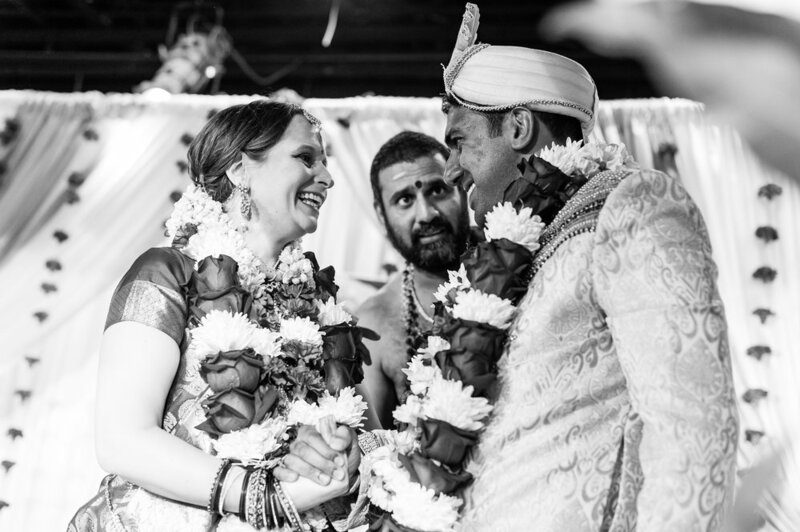 I was so excited to work with them because their wedding day was going to be very eclectic - they'd start off with a traditional wedding ceremony at Murugan Temple of North America in Lanham, MD, and end the day with a non-traditional, modern reception at the Newseum. I decided to split this wedding into two blog posts cause it's just too good not to :) So today we'll focus on the morning ceremony and tomorrow we'll dive into their modern reception! The day started off with Victoria getting ready at the Hotel Monaco. 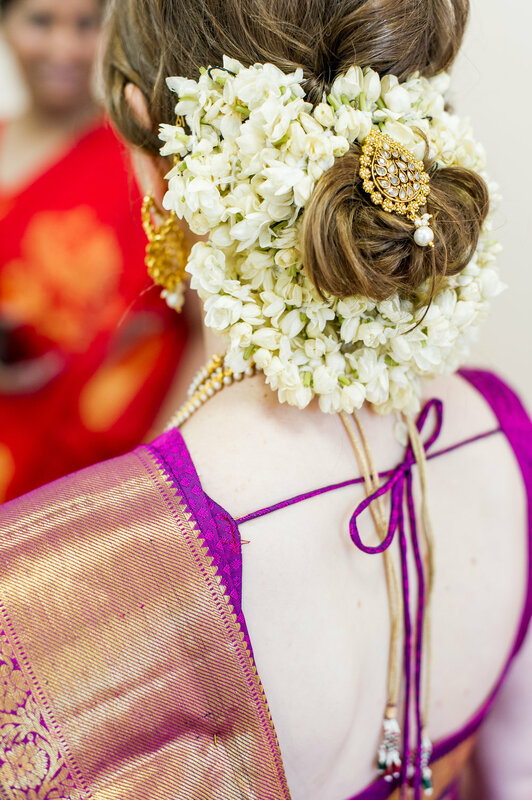 They then proceeded to the temple for various ceremonies throughout the morning (including a saari change! ), followed by a luncheon of delicious food post-ceremony at the temple. As many of you know we launched an event design branch at The Plannery recently. Ann and Stephen were one of our first test subjects (! ), so I thought it would be fun to take a look at how their moodboard from Kim came to life. 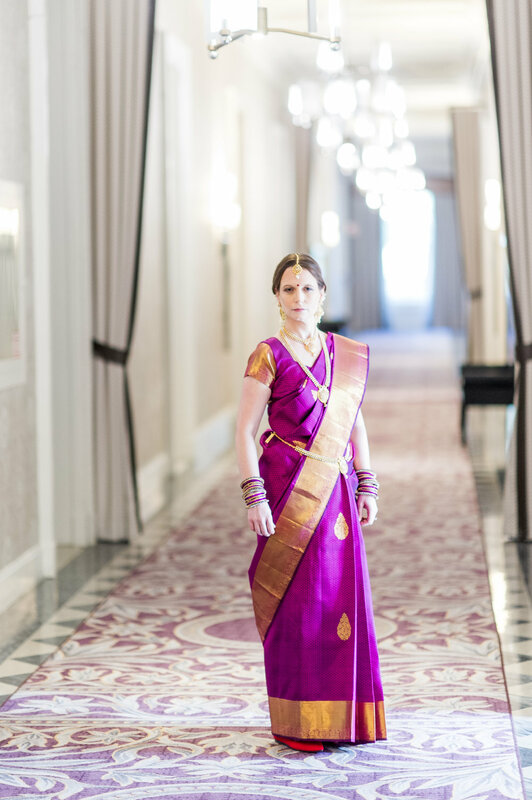 Ann and Stephen wanted a colorful, modern wedding to fit in with their somewhat unique venue, Clarendon Ballroom. Kim came back to them with some beautiful bold colors in various shades of pink along with a deep blue, and accented by gold and green. As you'll see, Ann's bridesmaids dresses played into the darker pink tone, while her florist brought out the brighter pinks and green accents. We went with the dark blue linens which perfectly matched Kim's design board - as did Stephen's suit! 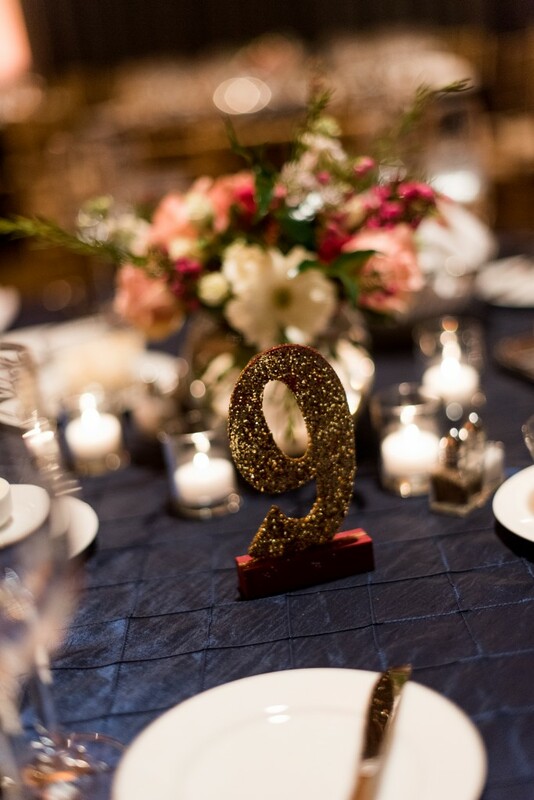 The gold chairs, and gold table numbers were great gold accents - and though we didn't get photos of it, they served sparkling rose to their guests pre ceremony! Please be sure to ask us about our design services whether you're a coordination or planning client! I had the pleasure of first meeting Madeline and Phillip along with Madeline's mother, father, and sister. What a beautiful, caring, and diligent family. Everyone was really involved, though nobody more than the bride herself! 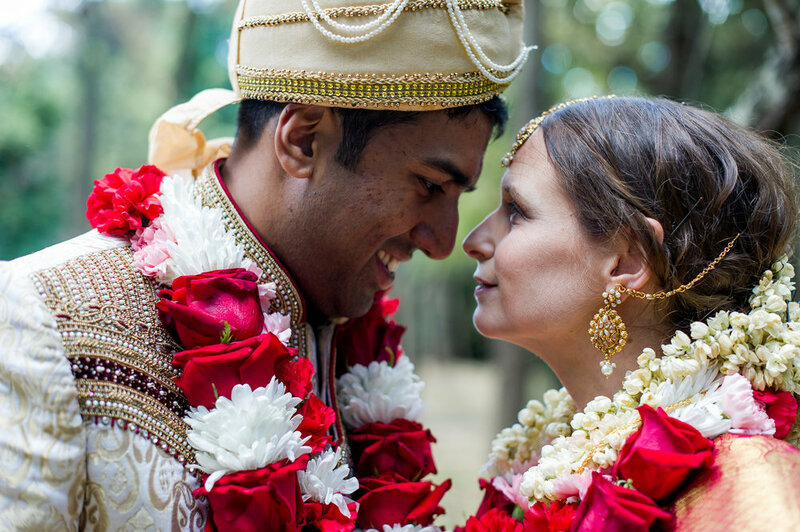 They each played their own special role in making the fantastic wedding become reality. Overall, their wedding was intended to be a warm, intimate gathering with their closest friends and family - a small gathering where Madeline and Phillip could share and absorb love and laughter with each and every one of their guests. I am happy to say that we accomplished just that!! Madeline and Phillip included many fun details in their reception that I just loved! Fountain pen ink bottles with flowers were used as small, but mighty centerpieces. The cutest cake toppers ever! The coolest MC ever! And handmade ribbon wands that they created, that totally made a super unique and beautiful (and mess free!) exit to their fancy getaway car. I also very much enjoyed their addition of yummy donuts from Sugar Shack on the dessert station. The stage was set at a simply beautiful lake view venue in Reston. Though the sun decided not to shine, there was plenty of brightness on this day. I will never forget Madeline’s infectious smile and laugh. I must say that Phillip is quite a lucky man to get to experience that for a lifetime. And I think Phillip is a huge source of that smile, so that makes Madeline quite the lucky one herself. These two were a joy to work with and I am so honored that I was asked to be part of their special day. 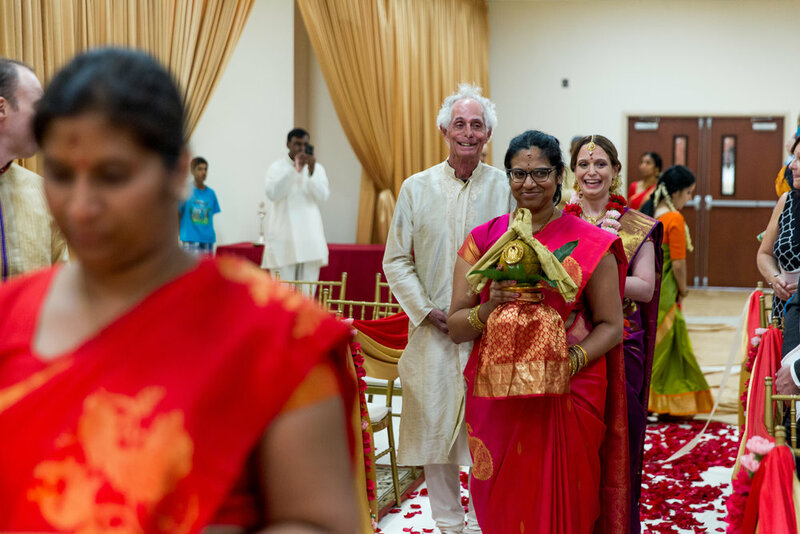 In case you missed it, earlier this week we took a look at Huma and Sayeed's colorful henna party. Today is their beautiful wedding at Meadowlark Botanical Gardens. 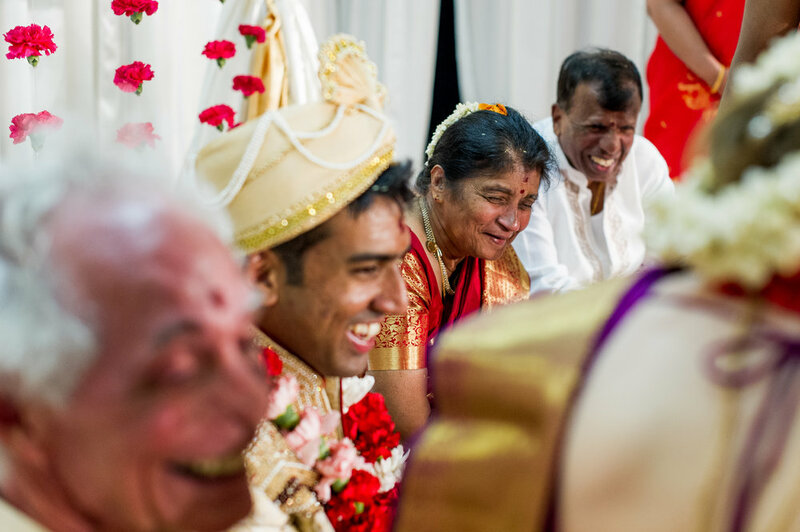 As many south asian weddings are, this was a big wedding - and because it was December (!) using the outdoor area of Meadowlark's beautiful gardens for ceremony and cocktails just wasn't an option. So Huma opted to have people sit at their reception tables for the ceremony, thus eliminating any need to "flip" the space and keeping things simple and fun for her many guests! After getting ready, Huma and Sayeed did a first look and some portraits around the grounds (please be sure to not miss Huma's ROCKING sneakers, folks), and then walked each other down the aisle, which I adored (and always adore). 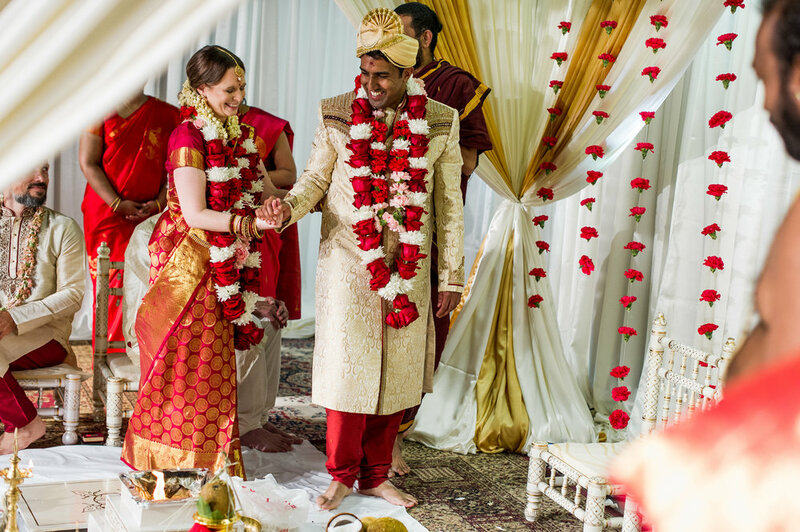 The ceremony was beautiful (especially in front of the stunning floral arch Sarah Khan Events created!) and we then merged right into cocktails, followed by dinner. I have to give a huge shout-out to Carmen and her staff at C&G Catering. They were amazing to work with and helped run a difficult event (considering the caterer who shall not be named showed up incredibly late with all of the food!). After dinner, Huma and Sayeed kicked off dancing with their first dance - "You're Just Too Good To Be True" into Michael Jackson's "BAD"! LOVED IT. They ended the night by sneaking some shots in at Meadowlark's Winter Walk of Lights. Once again, big thanks to Mary Sandoval for these absolutely gorgeous photos. And huge congrats again to the loveliest of couples, Huma and Sayeed!! 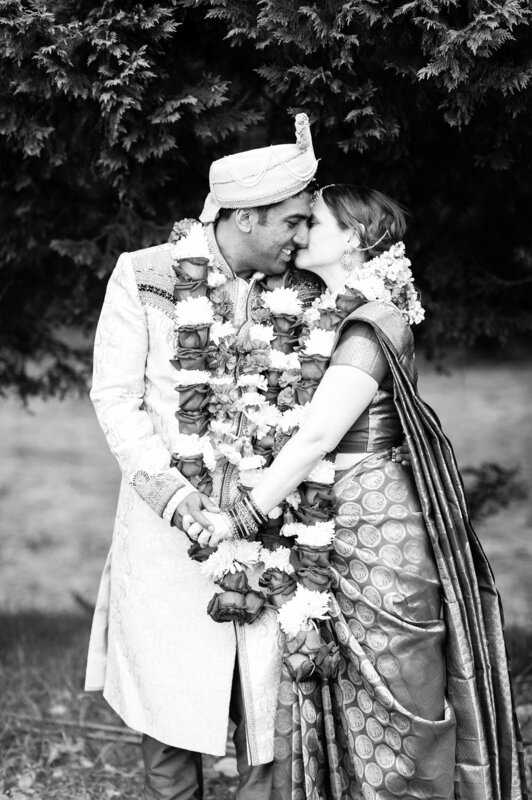 I've decided to break Huma and Sayeed's wedding into two parts - namely, because I helped them with two events and their are just too many beautiful photos to share! I assisted with both their informal henna party the night before, and their actual wedding ceremony and reception the following day. Huma and Sayeed were such a beautiful couple to work with. Huma is a self-professed Type A - the social organizer of the pair, bustling with energy and silliness. While Sayeed is super relaxed, chill and down to earth. The way they balanced each other throughout the planning and their days of celebration was a lovely thing to behold - a wonderful match that speaks volumes as to how their marriage will be for years to come. This was a fun one for me because it was "off season" - in mid December which is rare for us wedding planners. 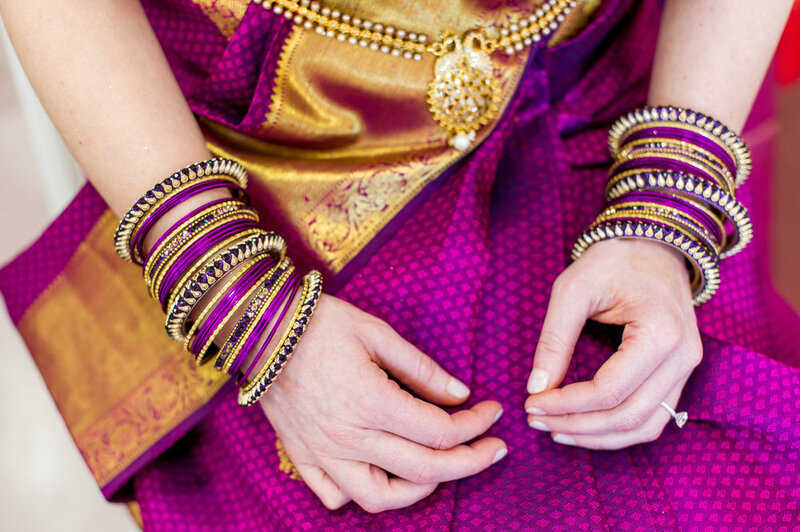 The henna party took place at the Crown Plaza at Crystal City and was a mix of traditional vs. non traditional because this really was a fusion of Pakistani and Bangladeshi families and cultures. It was co-ed rather than all-female, but they did partake in several traditional moments (including the tradition of stealing the groom's shoes and him having to pay to get them back!) - and provided delicious south asian food! Sarah Khan Events did the decor for both the henna party and the wedding - it was so colorful and fun! The Mehndi artist was there all night (I even got to sneak in a quick one myself right before she left) and did such a beautiful job. 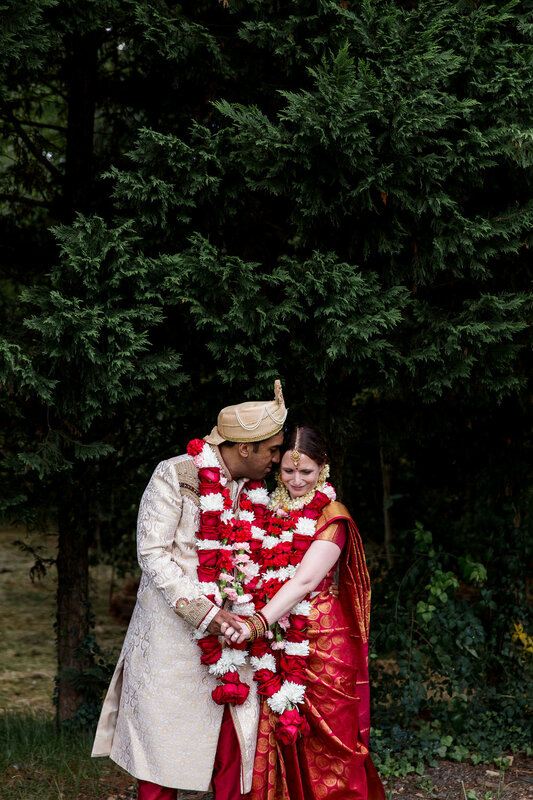 So enjoy these beautiful shots by Mary Sandoval (who was fabulous to work with) - and tune in next week for Huma and Sayeed's wedding at Meadowlark Botanical Gardens! Rachel and Michael had a beautiful wedding at Riverside on the Potomac this past November. I must admit, I was a bit nervous at their hopes for an outdoor wedding in November - but they got lucky and we had stunning 60 degree weather that afternoon! Although the cold definitely creeped in once the sun went down, all the dancing, food and merriment kept everyone good and toasty. They started the day with a casual tisch/bedeken followed by the signing of the ketubah. A beautiful ceremony was down by the water - and Rachel hand-made their chuppah! Cocktails were back up in the stables, with dinner, dancing (and ingenious jump roping!) in the barn. We were accompanied throughout the day by the excellent band, Golem. And the evening ended with a stunning view of the super moon! Big thanks to Charlie at Charles Archambault Photography for the photos, and congrats again to Rachel and Michael! Laura and Matt were a true joy to work with. I helped coordinate their intimate wedding at The Whittemore House this fall and loved every minute! Unfortunately we had some rain on their day, so they ended up doing their first look in their hotel room, followed by something I adored - they read each other their vows, just the two of them, prior to the ceremony. I really loved that they created this moment for themselves - it was a lovely reminder that a wedding day is about the two people getting married and what they are promising each other. They decided to have the fireplace at The Whittemore House be the focal point for their ceremony which I loved. After the ceremony, guests went into the front of the house for cocktails while we flipped the ballroom for dinner. Dinner, toasts and dancing followed! (p.s. - THAT DRESS. Ok I'm done now). Congrats again to Laura and Matt! In Marie and Brad's initial inquiry they mentioned that their interfaith wedding was going to reference, Star Trek, Harry Potter, Game of Thrones, and she planned on walking down the aisle to the theme from The Princess Bride. I was ecstatic. On their day, after some getting ready photos they did a first look at their ceremony site, the George Washington Masonic National Memorial, followed by the ketubah signing. The opening announcement started with "Mawwage... Mawwage is what bwings us togetha...today" (which was not the first wedding I'd done with that opening, which means I'm winning at life). Add in their DIY chuppah, Marie's beautiful veil, a touching tribute candle to a close friend Marie had lost recently, and the gorgeous space and you had a truly lovely ceremony. Guests were then transported to Hotel Monaco, Alexandria in Old Town. Unfortunately we had a ton of rain, so the courtyard was unavailable for cocktail hour. But we rolled with it and had an awesome reception thanks to the great staff at Hotel Monaco and all the other great vendors. Marie was a DIY queen, putting together her own centerpieces and lots of other fun personal touches. So enjoy these great photos by Andrew Morrell Photography and big congrats again to Marie and Brad! R & E got married this past summer at Arena Stage, a venue I'd been dying to work in for a while now. They're a private couple so we won't be showing any photos of their faces or their guests' faces - but I still had to blog about this one cause it was so special, so much fun, and Jess Latos Photography took some stunning pics! E is Ethiopian, and R is Jewish. They wanted to plan their wedding fairly quickly, so we jumped right in! They incorporated various traditions throughout their day. My favorite was the Ethiopian cuisine - and the wet naps that were on every table that said "Marriage is Messy"! R was also pregnant - and therefore a glowing, stunning bride. We made it through the hora without any dropping or falling incidents which was my major fear (! ), so I considered the evening to be a big success! 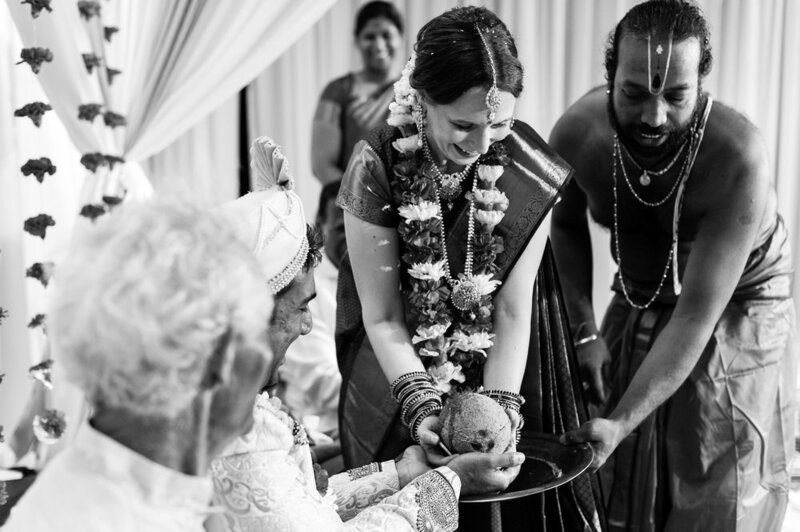 This was one of the most beautiful weddings I've done that seamlessly incorporated different traditions - experiencing these cultures merging and celebrating together was really touching and, frankly, brought me to tears at times during the night. So enjoy what photos I'm able to share (and big thanks to Jess Latos Photography for the beautiful images) and join me in wishing R & E a huge congrats on their marriage! I'm also happy to report their new little baby joined their family this fall and is happy and healthy! Congrats again to R & E - much love to you both! Yet another beautiful wedding that Tarra coordinated this year at one of my favorite venues, Josephine Butler Parks Center. Let's hand it over to Tarra for more details! What a treat this wedding was to work! Kathy and David planned the most love-filled wedding there could be. Beginning with the warm and charming Josephine Butler Parks Center. It was important to them for their wedding to mean just a little bit more. David, a lawyer, and Kathy, owner of a non-profit writing program for marginalized youth, are both very much involved with giving back to their D.C. community. So what better way than to host their wedding at an amazing venue that stands for community safety, health, education, arts, architecture, and agriculture? Not only is JBPC centrally located in D.C., its mission is to grow city-wide park-based community health and vitality by nurturing innovation and partnerships. Kathy and David took great comfort in knowing their venue rental fee went towards supporting such an important and meaningful establishment. The love was also felt by the volume of friends and family they invited to this joyous event. I must say the reception space was completely maxed out, but Kathy and David would not have had it any other way. Surrounding themselves with love and laughter on their wedding day as well as great food and drinks is exactly what they wanted to accomplish. And Spilled Milk definitely delivered on the great food part! There was no shortage of beauty in the space either. With Kathy’s wonderful mother at the helm of the décor plan, Yellow Door Floral Design provided quite the array of stunning floral arrangements. In addition to the guest tables, every nook, cranny, and fireplace mantle at JBPC was accounted for in terms of flowers and candles. It was really a treat to work with and watch this team of vendors transform this already beautiful space into an even more beautiful space. Though I did not join in the festivities, I was so delighted to see Michael O. Snyder Photography’s super fun and artistic shots of Kathy, David, and some guests at the National Mall. A place that is very near and dear to Kathy and Davids’ hearts. They were transported there in true D.C. style via the Old Town Trolley post-reception. Yet another loving aspect of this wonderful wonderful wedding! Congrats again Kathy and David!